La clase de música está a punto de comenzar para los más pequeños de la academia. Macéo ha sido el primero en llegar. Su idea era tocar el piano, pero ha descubierto que le encanta sentir en el pecho la vibración del chelo. 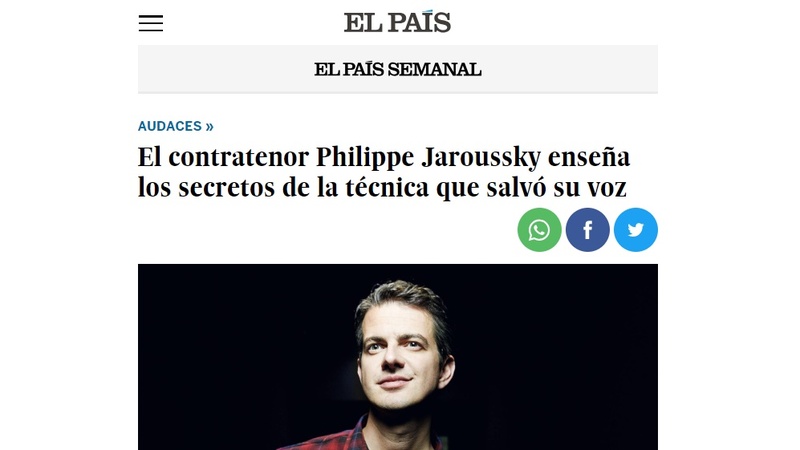 Aún no sabe si es su pasión, pero quizá Jaroussky pueda sentirse orgulloso dentro de unos años de haber ayudado a convertir al joven Macéo en un músico de éxito. The French countertenor – one of the most famous Classical artists – leads a life between tours and an academy where he promotes the career of young talents and passes on the technique that saved his career. The Île Seguin rises from the Seine as she takes her course through the West of Paris. The austere building of La Seine Musicale emerges from it, and at the top, its glass dome looks like a gigantic soap bubble that escapes to the river. Here, in one of the corridors of this center of cultural activities, the countertenor Philippe Jaroussky (born in Maisons-Laffitte, 1978) has started an academy. He founded it a year ago to discover talented children from homes with little access to resources, to boost the career of young talents and to pass on the vocal technique that saved his career two decades ago. caption: During a master class with a student, the baritone Louis de Lavignère. The violin was his first contact with an instrument, but Jaroussky owes his career to his voice. Starting out as a baritone, little by little he found himself being attracted by the register that traditionally belonged to the extinct “castrati”: that of a countertenor. The highest of male voices, a flexible, feminine, powerful and mystical sound – quite unusual at the time when Jaroussky, who will sing at the Teatro Real from October 23 to November 9, began debuting at the concert halls, and much better known now thanks to him. Singing with the face of a child and the voice of a woman, the French star impacted the world of Classical and – together with leading figures such as the mezzo-soprano Cecilia Bartoli – he has been a protagonist of the Baroque repertoire and elevated it to the very top. He collaborated with the best current ensembles, such as Les Arts Florissants and Les Musiciens du Louvre-Grenoble, and [performed] at major venues such as the Concertgebouw in Amsterdam. He sells out the largest theaters and is among Classical music’s best selling artists. caption: Jaroussky gives instructions to one of his singing students. Together with leading figures such as the mezzo-soprano Cecilia Bartoli, he has been a protagonist of the Baroque repertoire. The soprano tells us that the director of the Royal Opera of Versailles called Jaroussky because the countertenor of a production got sick and they needed a replacement. Jaroussky gave him the name of William Shelton, Dalles’ classmate. Shortly after, the young performer was debuting with Les Arts Florissants. caption: Two children play in the classroom, shortly before the class begins. The music class is about to start for the youngest of the academy. Macéo was the first to arrive. His idea was to play the piano, but he has discovered that he loves to feel the vibration of the cello in his chest. He still does not know if it’s his passion, but maybe Jaroussky can feel proud in a few years of helping to turn the young Macéo into a successful musician.